As you turn onto Hollister Road in Imperial Beach, and go into the Tijuana River Valley, you feel like you are in a different world. It feels like the dusty countryside in Mexico, and a place where non-conformists live. This is where you will find Ferdinand’s Familia, a sanctuary for large and small animals, run by an unusual couple. Ferdinand, the peaceful bull, is a good symbol for this place that was founded by vegetarian peace activists, Michael Pratt and Janice Jordan. They have shared the same vision in life for 19 years. Both are members of the San Diego Peace and Freedom Party. Ferdinand’s Familia first started in 2008 in their home and with rental stalls. However, as word got out and they began to rescue more neglected and abandoned animals, they realized they needed a larger property of their own. The present sanctuary opened in 2012. They received 501C3 status and are now a non-profit with five board members. Pratt and Jordan are the managers. He is the PR person who likes to tell each animal’s story and she is the adoption “tsar,” as he calls her. They have combined their vegetarian peace activism with rescuing animals and providing them good homes. This fits in with their colorful backgrounds. In 2004, Native American activist Leonard Peltier ran for president with Jordan as his running mate. In 2006, Jordan ran for governor of California. She has since semi-retired from politics. She is a social worker and is currently working with the organization, Crossroads, which helps women recently released from prison integrate back into society. She really has two jobs since working with Ferdinand’s Familia is also a full time job. Pratt trained as a biologist. He has worked in the biotechnology field for the last 30 years. He is also a retired cage fighter/wrestler/ mixed martial arts expert and coach. Like Jordan, his number one passion nowadays is the sanctuary which is partially funded with his money. One can see the passion that Pratt has for both the sanctuary and biology when he talks about Bella, a very friendly and gentle all white pony. He explains that Bella is not an albino; her coloring is just white with very tiny specs of black that have white hair growing out. Like the majority of the animals there, Bella is a rescue pony. 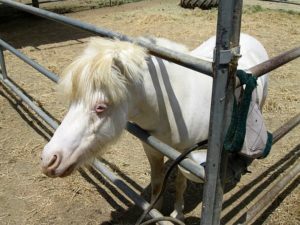 Pratt rescued her from a terrible hoarding situation where she was being held for collateral for payment of hay. Today, she lives a good life and is pregnant. Pratt is eagerly awaiting the baby. Pratt is the intense ambassador for his sanctuary. Talking a mile a minute, he loves to show visitors around, explaining the history of each animal and how they were rescued. One can see how much pride he takes in giving the animals a good home. Indeed, the horses there were very friendly although not all were suited for riding. Nevertheless, after hearing some of the horror stories, it was evident that they have come a long way in their trust of humans thanks to Pratt, Jordan and some loyal volunteers. He has gotten his horses in a variety of ways, such as from hoarding situations, owners that could no longer care for the horses, and people who have gone to prison. The sanctuary is a public partner with the San Diego Humane Society and the Department of Animal Services in Bonita. 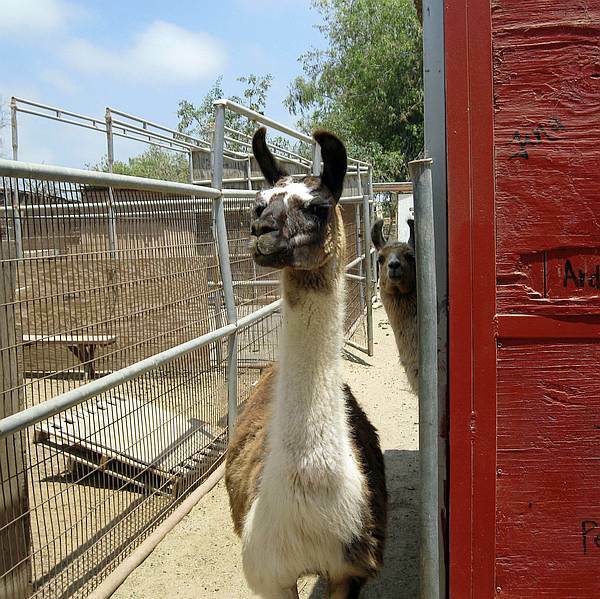 Besides the horses, the sanctuary also has llamas, goats, and sheep. In fact, this place has some of the friendliest llamas and goats I have ever met! I was particularly taken with a sweet and soft llama named Asia who followed me around, wanting to be petted. Llamas normally do not like to be touched much, but because they got Asia when she was just a baby, she likes human contact. Asia is a lucky girl who was rescued as a baby from a ranch where the neighbor’s loose dogs roamed around. These dogs attacked and killed Asia’s mother when the baby was just two weeks old. The rest of the herd surrounded Asia and protected her during the attack. After that, Pratt went out there and rescued Asia, two Shetland ponies, and an angora goat. Asia was still very young and she needed mother’s milk, so Pratt’s other llama Bhu, stepped in to feed and take care of her. Pratt calls her the best mom ever. Bhu and Asia are now inseparable. The goats there were also very sociable, staring and crowding around us. My favorite goat was a little black and white fellow named, Rudy. Finally, this sanctuary welcomes visitors and sponsors. Sponsors can “adopt” one of the animals there and come by and take care of it, and spend as much time as they want interacting with their adoptee. For many, this is a way of enjoying a large animal while taking care of it, but without the worries of housing it. Donations of any kind are very welcome as are volunteers who want to come and help. Although I didn’t meet any that day, they also have dogs and cats up for adoption that they keep at their home in Bonita. They have their own brood of wolf-dogs and foster others. They have 16 cats, and Jordan proudly noted that people always comment on how friendly their cats are. They have pictures of the dogs and cats up for adoption on their website. Kudos to this couple for their grassroots efforts, and all they have achieved in helping animals in need. Sometimes flying blind and learning along the way, they have opened an exemplary sanctuary in Imperial Beach. For a private or group visit or to find out about becoming a sponsor or volunteer, visit their website and Facebook page. With advanced notice, they also welcome school children to come and visit.